I always tell people that eating healthy is not hard and it shouldn’t have to be. I came up with this super easy salad randomly one day. It has a lean protein, healthy fat, veggie, fruit, and a tasty vinaigrette. It will take you less than 10 minutes to throw together. Perfect for lunch or dinner! 1 handfull of chicken – I used Trader Joe’s Just Chicken pre-packaged in refrigerated section. 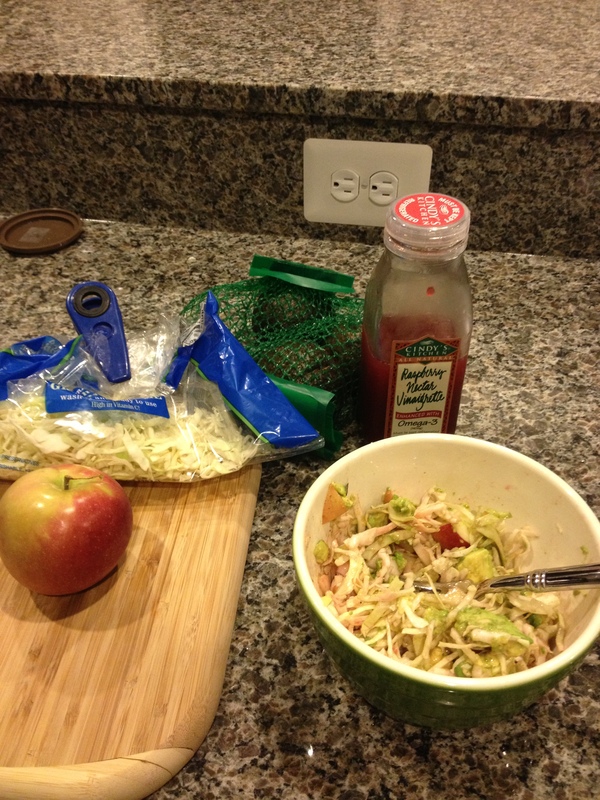 2-3 cups of green cabbage – I used Trader Joe’s already chopped and ready to use. Cindy’s Kitchen Raspberry Nectar Vinaigrette – Found at Whole Foods. If you don’t have this try a gluten free, dairy free vinaigrette of your choice. 1. Chop apple. Slice avocado in half, discard center, and chop one half. 2. Place 2-3 cups of green cabbage in bowl. Add diced chicken, avocado, and apple. 3. Toss with vinaigrette. Keep it on the light side 3-4 tablespoons should be plenty.